In November 2010, André appeared twice in programs on the UK TV station ITV 1. First he performs "Roses from the South" in the "Alan Titchmarsh show" of November 11th and next he has an interview in the "This Morning" show of November 15th and plays another few melodies. Thanks to Peter and Judith from the UK for sending us the videos. 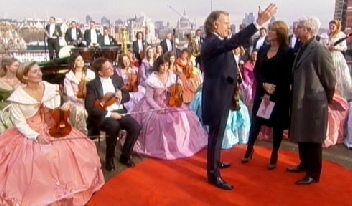 On a cold November Monday André Rieu and his Johann Strauss Orchestra played a one song concert along the South Bank Riverside Walkway of the Thames in London.